The two most important life functions that organisms carry out to persist in the environment are reproduction and growth. In this chapter we examine the role of climate and climate variability as controlling factors in the growth of one of the most important and productive of the North American boreal forest tree species, white spruce (Picea glauca [Moench] Voss). Because the relationship between climate and tree growth is so close, tree-ring properties have been used successfully for many years as a proxy to reconstruct past climates. Our recent reconstruction of nineteenth-century summer temperatures at Fairbanks based on white spruce tree-ring characteristics (Barber et al. in press) reveals a fundamental pattern of quasi-decadal climate variability. The values in this reconstruction of nineteenth-century Fairbanks summer temperatures are surprisingly warm compared to values in much of the published paleoclimatic literature for boreal North America. In this chapter we compare our temperature reconstructions with ring-width records in northern and south-central Alaska to see whether tree-growth signals in the nineteenth century in those regions are consistent with tree-ring characteristics in and near Bonanza Creek (BNZ) LTER (25 km southwest of Fairbanks) that suggest warm temperatures during the mid-nineteenth century. We also present a conceptual model of key limiting events in white spruce reproduction and compare it to a 39-year record of seed fall at BNZ. 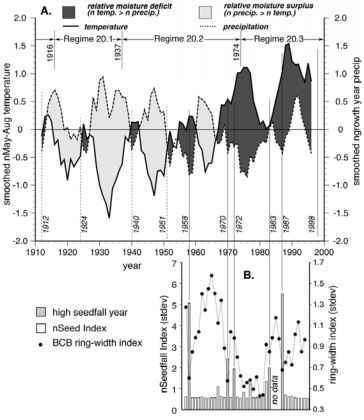 Finally, we derive a radial growth pattern index from white spruce at nine stands across Interior Alaska that matches recent major seed crop events in the BNZ monitoring period, and we identify dates after 1800 when major seed crops of white spruce, which are infrequent, may have been produced. The boreal region is characterized by a broad zone of forest with a continuous distribution across Eurasia and North America, amounting to about 17% of the earth's land surface area (Bonan et al. 1992). The boreal region is often conceived of as a zone of relatively homogenous climate, but in fact a surprising diversity of climates are present. During the long days of summer, continental interior locations under persistent high-pressure systems experience hot weather that can promote extensive forest fires frequently exceeding 100 kilohectares (K ha). Summer daily maximum temperatures are cooled to a considerable degree in maritime portions of the boreal region affected by air masses that originate over the North Atlantic, North Pacific, or Arctic Oceans. Precipitation is abundant in the boreal zone of most of the Nordic countries and western Russia, whereas east-central Siberia experiences low winter snow depths because the strong Siberian High suppresses precipitation. The boreal landscapes of far eastern Siberia and western North America are mountainous, whereas the topography of most of central and western Siberia and eastern Canada is less mountainous. The mountainous boreal regions are characterized by local climates (Pojar 1996), aspect-controlled differences in forest types (Viereck et al. 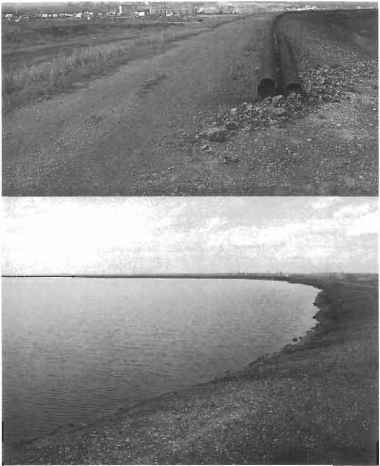 1986), and a much more irregular boundary between forest and tundra (figure 12.1). In the topographically complex landscapes of Alaska, northwestern Canada, and central and northeastern Siberia, precipitation limits forest growth, so natural grasslands are part of the landscape. Precipitation at BNZ is influenced by the Pacific Monsoon and reaches a distinct maximum in the late summer. In other parts of the boreal forest region, precipitation is more evenly distributed throughout the year or even reaches a winter maximum. All this regional climatic variation must be taken into account as a fundamental backdrop when considering temporal variability and ecological response in boreal forests. On both continents, neither the northern nor the southern boundaries of the boreal zone are aligned at the same latitude east to west. The Icelandic Low and Aleutian Low deflect storm tracks and advect relatively mild air masses northward as they approach the western margin of Eurasia and North America, respectively. As a result, the boreal forest belt is located considerably farther north in both the Nordic countries and western North America than in the center of the continents. By contrast, cold polar air flowing southward follows a persistent path along the eastern portion of both continents, and, consequently, the boreal forest belt reaches its southernmost limits there. Essentially, all of the boreal forest in Alaska is north of 60° N, and practically all the boreal forest of eastern Canada is south of 60° N (figure 12.1). The boreal forest region is particularly prone to climatic variability because minor variations in these key features of atmospheric circulation can either intensify the advection of warm air into this naturally cold region or enhance the distribution of cold air southward through the region. Figure 12.1 Distribution of the boreal forest of North America. Note the southward depression of both the northern and southern extent of the forest in eastern Canada, and the northward extension of boundaries in Alaska. Mountain topography in western North America is associated with complex and irregular forest boundaries. BNZ LTER represents the Interior Alaska boreal forest (figure 12.2A) and is made up of two sites, Caribou-Poker Creeks Research Watershed and Bonanza Creek Experimental Forest. All subsequent references to the BNZ in this chapter refer to the Bonanza Creek site (figure 12.2B,C). Interior Alaska is a well-defined region of complex physiography, delimited in the north by the Brooks Range and in the south by the Alaska Range. The region essentially covers the area between 63 and 67° N. Interior Alaska extends from the Yukon Territory at 141° W westward to the Bering Sea climatic boundary at about 155° W, where precipitation exceeds 400 mm (Edwards et al. 2001). The region is made up of two large, low-lying tectonic basins, the Tanana Valley and Yukon Flats, separated by uplands 500-1000 m in elevation. The regional climate is cold continental with January means -20°C or colder and July means 15-20°C, depending on elevation and location within the region. The Brooks and Alaska Ranges act as topographic barriers to moisture-laden air from surrounding oceans. Consequently, Interior Alaska is semiarid, with annual precipitation ranging from 400 to <200 mm (Patric and Black 1968). Precipitation generally declines to the east and is strongly influenced by topography (Edwards et al. 2001). About 60% of the annual precipitation falls as summer rain. Because annual precipitation in central Interior Alaska is low and summers are often warm, a precipitation deficit (excess of potential evapotranspiration over precipitation) develops. Calculated precipitation deficit values in Alaska include 9.5 cm at Bettles in the central Brooks Range, 18.8 cm at Fairbanks, and 28.9 cm at Fort Yukon (Slaughter and Viereck 1986). Figure 12.2 (A) Distribution of boreal forest in Alaska. Location 1 = south-central Alaska (Fort Richardson) tree-ring sample site. Location 2 = BNZ. Location 3 = Brooks Range tree-line sample site. (B) Location of tree-ring sample sites and BNZ in east-central Alaska. (C) Detail of tree-ring sample sites in the vicinity of Fairbanks and BNZ. Because of its high-latitude location just south of the Arctic Circle, BNZ experiences nearly continuous daylight at the summer solstice, and short daylight hours (minimum 3 hours 42 minutes) with only a few degrees of sun elevation in the winter. BNZ is located in the Tanana Valley, a broad low-elevation (133 m above sea level) lowland situated immediately north of the Alaska Range and south of the Yukon-Tanana Uplands of central Alaska (figure 12.2C). BNZ extends from islands and the north bank of the Tanana River up to the crest of the first range of hills or low mountains (440 m asl) northward. The high-elevation barriers of the Brooks Range and Alaska Range mountains surrounding BNZ deflect or subdue direct clashes of warm and cold air masses, resulting in moderate winds and periods with little air mass mixing. Climate records in Alaska are relatively sparse; most date from no earlier than the mid-twentieth century. The oldest continuous record from Interior Alaska is a combination of University Experiment Station (UES) and Fairbanks Airport data (Juday 1984). Trends in Fairbanks data are highly representative of the boreal forest region across Interior Alaska (Barber et al. 2000). During the period of instrument records (1906-2000) of the combined UES/Fairbanks (hereafter Fairbanks) station, mean annual temperature averaged -3.1°C. Average July temperature for Fairbanks was about 16.3°C during the period of record, and annual precipitation averaged 282 mm. The 30-year average (1950-1979) of growing degree-days (GDD) based on the 5°C threshold at Fairbanks was 1075 (Viereck et al. 1986). During the 24-year period of 1973-1997, GDD at the Fairbanks International Airport station increased 10.9% over the previous 24 years (1949-1972) (Juday et al. 1998). Three semipermanent centers of atmospheric circulation are important to the weather in Interior Alaska: (1) the Aleutian Low, which sits over the North Pacific Ocean and occurs 25% of the time, making it the dominant influence on the Gulf of Alaska (Overland and Heister 1980); (2) the East Pacific high-pressure system that is present throughout the year off the coasts of California and Baja California; and (3) the Siberian high-pressure system located over eastern Asia. The position of the Aleutian Low moves southeastward from the Bering Sea into the Gulf of Alaska between August and December. In January, the Aleutian Low moves to the western Aleutians, where it slowly dissipates through July (Favorite et al. 1976). The East Pacific High reaches maximum intensity and northward position from June through August. It dominates most of the North Pacific, including the Gulf of Alaska (Favorite et al. 1976). The Siberian High is associated with a huge pool of very cold winter air over eastern Asia and northern Alaska, which reaches its maximum intensity in January. When entrenched, it causes a southward shift in the Aleutian storm track and an increase in cold winds blowing from the north over the western Gulf of Alaska (Wilson and Overland 1986). Interior Alaska has two distinct summer circulation patterns apparent in records of interannual climate. During the twentieth century, the summer climate in Interior Alaska has alternated between periods of colder/wetter and warmer/drier weather than the long-term mean (Edwards et al. 2001; Mock et al. 1998). The synoptic pattern for colder/wetter conditions is produced by an eastward shift of the East Asian trough, an upper level jet-type feature centered over eastern Asia, and a stronger than normal Pacific subtropical high. Both the eastward shift and the intensification of the subtropical high increase the frequency of storms containing moisture-laden air entering the interior basin from the southwest, the only direction free of a major topographical obstacle. A high-pressure ridge located north to northeast of Alaska produces the synoptic pattern for warmer/drier conditions. The high center brings clear skies and warm dry continental air from the east at the season of maximum surface heating from the long daylight hours near the Arctic Circle. Negative surface-pressure height anomalies over the Yukon Territory of Canada and over northern Siberia represent a northwest shift of the average pressure system. The Pacific Subtropical High located south of Alaska is weak under this regime, resulting in re duced flow of moist air from the west. Persistent blocking ridge conditions are directly correlated with periods of extensive wildfires across the western North American boreal forest (Johnson 1992). Mean summer (May-August) temperature at Fairbanks is highly variable in several respects (figure 12.3A). The smoothed mean summer temperature record displays an apparent quasi-decadal cycle through the twentieth century in which highs and lows of cycles alternate regularly every 7 to 8 years (figure 12.3A). Results of spectral analysis of the longer (1800-1996) and highly correlated reconstructed summer temperature series are discussed later. The coefficient of variation (unbiased) for summer temperatures during the period 1906-2000 is 7.99, indicating high variability. The 1976-1977 regime shift, evident throughout Alaska and the North Pacific region of North America (Ebbesmeyer et al. 1990), represents the most important long-term change during the period of record. After the regime shift, sustained levels of warmth as measured by mean annual temperature (MAT), winter mean temperatures, and summer mean temperatures ramped up to a new level not seen previously in the twentieth century in Alaska (Juday 1984; Juday et al. 1998). Mean summer temperature in the 20 years following the shift (1977-1996) was 14.15°C, an increase of 0.52°C compared to the 20 years prior. The 1977-1996 mean summer temperature after the shift was 1.46°C warmer than the coldest 20-year interval (1922-1941). The warmest mean summer temperature (15.83°C) occurred in 1990 after the shift. The coldest mean summer temperature (10.40°C) occurred in 1922. The 5.43°C difference between the warmest and coldest summers is so large that it represents a considerable challenge for the dominant plants to have a set of adaptive traits able to cope with such divergent conditions. The smoothed Fairbanks growth year precipitation record (October-September) also displays a marked quasi-decadal cyclicity (figure 12.3A). The tendency of the peaks of the temperature cycle to occur at the troughs of the precipitation cycle is an expression of the strong tendency for climate to remain in either the cool or cold/wet mode versus the warm or hot/dry mode. However, the long-term trend of Fairbanks precipitation is less variable than temperature. A few years of heavy snowfall occurred in the early 1990s, but otherwise annual precipitation has decreased slightly in the late twentieth century compared to the early and middle part of the century. Other Interior Alaska stations such as Bettles and McGrath also show little change, although some coastal northern Alaska stations have experienced an increase in precipitation. Increased temperature without a concurrent increase in precipitation means that effective moisture is lowered. From about 1912 to 1968, the predominant mode of climate was cool and wet with a relative moisture surplus, broken only briefly by warmer and drier intervals (figure 12.3A). Cool/wet periods lasted on average for 9-10 years (min. 6 years, max. 14 years). During a transition period between 1951 and 1970, precipitation and temperature averaged near the long-term mean, although muted cycles were present (figure 12.3A). After the mid-1970s, climate switched to a hot and dry mode characterized by a strong relative moisture deficit (figure 12.3A) (Barber et al. 2000). Figure 12.3 (A) Normalized May-August mean temperature and growth year (October-September) precipitation during the period of record at Fairbanks, Alaska. Values are smoothed with a 5-year running mean. Horizontal line represents long-term mean of both temperature and precipitation. Periods of above long-term mean precipitation and below mean summer temperature (relative moisture surplus) are indicated in light shading. Periods of above long-term mean summer temperature and below mean precipitation (relative moisture deficit) are indicated by dark shading. Summer temperature regimes (see figure 12.5 for definition) are indicated. Years of known (solid) or inferred (dashed) high white spruce seed crops are indicated by vertical lines. (B) Seed fall index compared to radial growth at Bonanza Creek Bluff (BCB), located near the seed fall collection site. Seed fall index is equal to 1 plus the normalized (subtraction method) raw seed counts from seed traps. The UP1A record began in 1957 and ended in 1982; the stand was killed in the 1983 Rosie Creek Fire. The UP3A seed fall record began in 1968 and continued until 1983, then again from 1987 to the present. During the period of overlap, the mean of seed counts at both sites is used. The five major seed crop years are highlighted. Solid line with circles represents ring-width index (normalized and detrended radial growth). Note the steep 1-year declines in radial growth during years of major seed crops. White spruce is the predominant forest cover, occupying 12.1 million ha in Alaska or about 26% of boreal forest (Labau and van Hees 1990). Nearly 2.8 million ha of the white spruce forest (about 23% of white spruce-dominated stands) meets the USDA Forest Service standard of commercially productive forest. The two main types of white spruce-dominated ecosystems are floodplain and upland (Viereck et al. 1986). White spruce-dominated floodplain stands are particularly extensive along the broad and shifting floodplains of the large aggrading rivers (rivers with rising relative elevation because of sediment buildup in the riverbed) fed by glacial meltwater such as the Yukon, Matanuska, and Tanana (Van Cleve et al. 1993). Much of the focus of the BNZ research program historically has consisted of direct observations, measurements, and experiments on primary successional surfaces of the Tanana River floodplain, including late successional white spruce (e.g., Van Cleve and Viereck 1981; Yarie et al. 1998). However, radial growth of glacial flood-plain white spruce generally does not correlate at a statistically significant level with Fairbanks air temperature or precipitation; thus the focus of this chapter is on the very different upland white spruce stands of BNZ and similar sites across Interior Alaska (figure 12.2). Upland stands dominated by white spruce are broadly distributed across valley, hillside, and mountain landscapes. White spruce is usually present in at least minor amounts in most upland forest community types, even on sites where it is not dominant, with the exception of permafrost-dominated sites (Viereck et al. 1992). White spruce is an important, if not the dominant, tree-line species in much of Interior Alaska in the Brooks Range, Alaska Range, and highlands between them (Juday et al. 1999; Viereck 1979). To a large extent the distribution of dominant tree species in most forest communities in Interior Alaska has been shaped by fire (Dyrness et al. 1986). The Interior Alaska boreal forest appears to be adapted to a stand-replacement disturbance system. Typically, succession on burned white spruce sites in Interior Alaska leads to reestablished white spruce dominance in 150 to 300 years (Foote 1983). Tree rings contain a wealth of information about the conditions affecting the growth and health of trees (Fritts 1976). Although ring-width measurements are familiar, new technology allows measurements of other tree-ring properties, such as x-ray densitometry (Jacoby et al. 1988) and stable isotope analysis (Leavitt and Danzer 1992) that have been explored only recently for the information they contain. Tree rings are a reliable indicator of the state of a tree's health or vigor, as well as a direct measure of the rate of product accumulation in stands managed for forest products (Nyland 1996). Larger tree rings are possible only under optimum growing conditions, although smaller tree rings result from a variety of potentially stressful conditions. In northern conifers maximum latewood density increases when moisture stress during the mid- to late growing season is great (D'Arrigo et al. 1992). Maximum latewood density of boreal conifers may be an appropriate index for canopy growth as indicated by satellite-sensed Normalized Difference Vegetation Index (NDVI) values where productivity is temperature related (D'Arrigo et al. 2000). Carbon 13 (13C) isotope content is generally measured as discrimination or change in the amount of isotope in sampled plant tissue compared to a reference standard. Less 13C discrimination (greater 13C) indicates production of the subject plant tissue under a condition of restricted stomatal exchange, generally as a result of moisture stress (Livingston and Spittlehouse 1996). Maximum latewood density, 13C isotope discrimination, and ring-width of upland white spruce stands in BNZ and similar sites are generally well-correlated with each other, although the first two ring properties are less autoregressive than ring-width, and so contain information generally specific to the climatic conditions of the year of ring formation (Barber et al. 2000). In this chapter summer temperature reconstruction is based on the maximum late-wood density and 13C isotope discrimination, and white spruce growth responses are based on ring-width (Barber et al. in press). Classic dendroclimatological technique starts with the selection of widely spaced trees assumed to be free of crown-to-crown canopy competition. Trees growing in marginal environments are preferred where one clear factor of the environment is assumed to limit growth. The goal is to extract a pure climate signal from the measured tree-ring properties. Tree lines are considered to be a particularly suitable environment for dendroclimatological sampling because trees found there are expected to be limited by lack of growing season warmth. Northern Alaska tree lines, both elevational and latitudinal, have been a popular subject of dendrochronologi-cal investigations (Cropper 1982; D'Arrigo et al. 1992; D'Arrigo and Jacoby Jr. 1992; Jacoby and D'Arrigo 1995; Jacoby et al. 1999; Jacoby et al. 1996; Overpeck et al. 1997). In virtually all these studies, the radial growth response of trees at tree line is positively correlated to temperature. Conversely, samples of white spruce on upland sites in BNZ display a strong negative sensitivity to summer temperature (Juday et al. 1998; Juday et al. 1999). The negative relationship of radial growth to summer temperature in upland white spruce is consistent throughout the twentieth century, occurring in 20 stands (including 2 stands in BNZ) representative of dominant and codominant trees in mature and old stands throughout Interior Alaska, including trees across a broad range of diameters (Barber et al. 2000). During the twentieth century, smoothed radial growth of these trees displays a 15-year cyclicity in which opposite trends in radial growth occur regularly over periods of 7 to 8 years (Barber et al. 2000). Properties of tree rings, including ring-width, 13C isotope discrimination, and maximum latewood density, are consistent with growth limitation because of temperature-induced drought stress (Barber et al. 2000). Ten of the 20 stands with ring-width records extended back far enough in time to cover most of the nineteenth century (figure 12.4A,B). Unprocessed ring-width data (1806-1996) subjected to spectrum analysis contains intermediate peaks at 8 and 16.7 years. However, preprocessing (differenced, 64-year segments sampled at 32-year intervals) treatment of the 191-year regional ring-width sample displays no significant periods at the 95% confidence level. Figure 12.4 (A) Mean ring-width index (normalized and detrended radial growth) for 10 white spruce stands depicted in figure 12.2. Summer temperature regimes (see figure 12.5) are identified across the top; vertical lines represent boundary dates of regimes. (B) Sample depth of ring-width sample, represented as both number of stands and number of individual trees contributing. Decline in sample size makes values prior to 1816 less reliable. We have recently extended the measurement series of 13C discrimination and maximum latewood density from the Reserve West stand in BNZ back to 1800 (Barber et al. in press). These two tree-ring properties passed a test of significance in a multiple regression/principal components-based reconstruction model to serve as proxies for a reconstruction of May through August temperatures at Fairbanks (Barber et al. in press) (figure 12.5A). Decadal-scale shifts appear in our reconstruction prior to the instrument record (figure 12.5A). Reconstructions of the annual Pacific Decadal Oscillation (PDO) index based on western North American tree-ring records, which account for up to 53% of the instrumental variance and extend as far back as a.d. 1700, indicate that decadal-scale climatic shifts have occurred in the northeast Pacific region prior to the period of instrumental records (D'Arrigo et al. 2001). Spectral analysis of raw (unprocessed) reconstructed Fairbanks summer temperature values display peaks at 9 and 18 years. However, again, peaks of preprocessed (differenced) reconstructed summer temperature (1800— 1996) may not be significant at the 95% level. High short-term (1- to 3-year) variability combined with rapid shifts between regimes tends to mask the quasi-decadal cyclicity. Figure 12.5 (A) Recorded and reconstructed summer (May through August) temperature (annual data) at Fairbanks, Alaska. Reconstruction is based on a two-proxy model composed of 13C discrimination and maximum latewood density in white spruce collected at the Reserve West site (figure 12.2C) in BNZ (Barber et al. in press). Regimes of summer temperature are identified along the horizontal axis. Vertical lines represent dates of regime change. The regime numbering system consists of century identifier (left of decimal) and sequential numeral within the century (right of decimal). (B) Nodes of change identified using a 17-year moving split window squared Euclidean distance (MW SED) metric. To identify nodes of change in the May-August temperature reconstruction, we used a moving split window analysis with squared Euclidean distance metrics (MW SED) (Johnson et al. 1992; Turner et al. 1991) (figure 12.5B). We used a moving window period (17 years) approximately as long as the putative cycle length in the reconstructed record in order to maximize change index values at transitions. The MW SED result shows peaks or spikes where the greatest change occurred, and we used these spikes to define the borders of climate regimes (figure 12.5B). 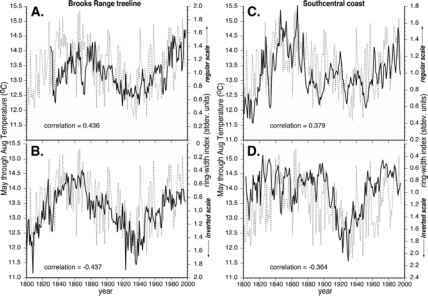 Our proposed regimes, then, represent multidecadal periods of characteristic sum mer temperatures extending between periods of rapid climate change (figure 12.5A). For convenience, we number summer temperature regimes for the century in which they began, and assign a decimal of 1 for the first regime initiated in the century with increasing decimal numbers for successive regimes of that century. Thus, the first regime initiated in the twentieth century is labeled 20.1. We have further divided one regime (19.2) into three subregimes (A, B, and C) of lesser magnitude change. Based on these criteria, the twentieth century contains Regimes 20.1, 20.2, and 20.3, and the nineteenth century is divided into three regimes as well. We tentatively identify a rapid climate change at about 1816 based on an apparent major change in variables compared to Regime 19.1, although we do not have MW SED values calculated before that year. These early years of the nineteenth century appear to have been part of a regime that began in the eighteenth century, and since we are unsure of the number of regimes contained in that century, we label that regime as 18.x. Regime 20.3 began in the mid-1970s and continues today. The most notable feature of this regime is the elevated summer temperature without a concurrent increase in precipitation, making this period the hottest and driest in the instrument record (figure 12.3). Spruce tree-ring properties respond in a pattern consistent with both of these features, especially because 13C discrimination is very low and maximum density is very high (Barber et al. 2000) (figure 12.5A). Relative tree growth, in contrast, has become increasingly lower (figure 12.4A), an effect we attribute to drought stress (Barber et al. 2000). The previous regime (20.2) began around 1937 and was characterized by cool summer temperatures and favorable moisture. Regime 20.1 (1916-1937) was the coldest in our 200-year series and had the highest growth year precipitation in the twentieth century. These climatic characteristics are consistent with an intensified summer maritime influence caused by a strong southwesterly flow bringing moist air through a gap in the mountain barriers that surround central Alaska. Measured tree-ring properties strongly reflect this climate signal, displaying high 13C discrimination, low maximum density values, and extremely large ring-width during both these regimes (figure 12.4A) (Barber et al. 2000). Regime 19.3, which extends from 1879-1916, was developed largely from the reconstructed proxy record. It was an unusually quiescent period notable for its lack of extremes (figure 12.5A). All three proxies were relatively flat, indicating no large swings in climate for a period of about 35 years. We conclude from the proxy data that Regime 19.3 was a period of moderate summer temperatures. As a result, white spruce radial growth was neither particularly high nor low (figure 12.4A). Consistent with our findings, tree-ring series from the northeast Pacific as well as PDO reconstructions indicate a shift toward less pronounced interdecadal variability after about the middle 1800s (D'Arrigo et al. 2001). Tree-ring proxies as well as the recorded Fairbanks data indicate a rapid shift (1-3 years) from Regime 19.3 to Regime 20.1. We divided Regime 19.2 into three subregimes based on distinct periods of change but of a much lesser magnitude than a complete regime shift (figure 4A,B). 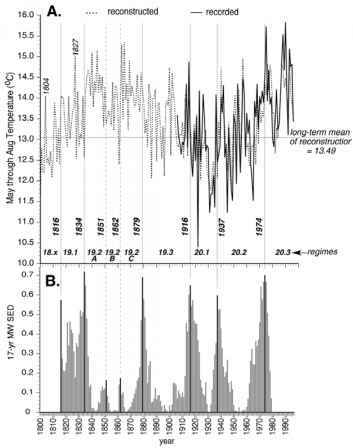 Overall, Regime 19.2 indicates relatively warm to hot summer temperatures de fined by rapid climate changes in 1834 and 1879 with decadal-scale cycles throughout. Although this regime is broken up by a somewhat cooler period between 1851 and 1862 (Regime 19.2B), the overriding signal from the proxies in Regime 19.2 is extreme summer warmth. The ring characteristics during this period most closely resemble (but not completely) those in Regime 20.3, with low overall 13C discrimination and high maximum density and small ring-widths, signals we attribute to extreme moisture stress during the twentieth century (Barber et al. 2000). Densities during Regime 19.2 are higher than the mean for the entire record but lower than during Regime 20.3 (warm summer temperature proxy). If the proxies maintained fidelity with environmental conditions observed in the twentieth century, then Regime 19.2 should be interpreted as a period of warm to hot/dry summer conditions. We tentatively identify a rapid climate change at about 1816, based on an apparent major change in 13C discrimination and radial growth compared to Regime 19.1. The pre-1816 values of ring-width and density must be viewed with caution because of the low sample depth between 1800 and 1816 (figure 12.4B). The reconstructed summer warmth of Regime 19.2 is surprising and not consistent with earlier dendroclimatological reconstructions in Interior Alaska (Barber et al. in press; Garfinkle and Brubaker 1980; Jacoby and D'Arrigo 1989; Jacoby and Ulan 1983). However, the 13C discrimination technique had not been applied previously to Alaskan white spruce, and it has some superior properties compared to the ring-width technique, such as lower autoregression and independence from some factors (biotic) that can affect radial growth for nonclimatic reasons. So it would be useful to determine whether long-term records of white spruce radial growth display responses about the time of Regime 19.2 that are consistent with strong summer warmth in Alaska. Ring-width records from a location near the tree line (upper North Fork of the Koyukuk River) exhibit both positive and negative sensitivity to reconstructed Fairbanks summer temperature, but both sensitivities show a response consistent with summer warmth during Regime 19.2, the period 1834-1878 (figure 12.6A,B). Similarly, a population of spruce (probably hybrids of white and Sitka spruce) at Fort Richardson on the south-central coast of Alaska near Anchorage includes some trees with positive and some with negative correlation of radial growth to Fairbanks summer temperatures (figure 12.6C,D). Again, both south-central coast populations show a radial growth pattern consistent with summer warmth during the period of Regime 19.2. 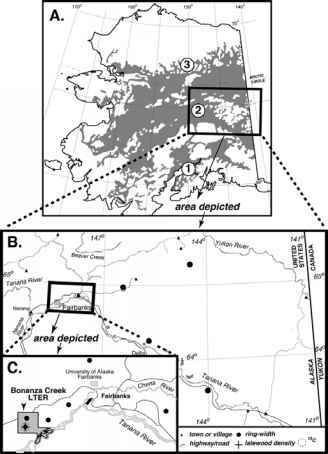 The integration of these results and known features of the Interior Alaska climate system and upland white spruce ecosystem presents a coherent picture. Figure 12.6 Relationship of white spruce radial growth (ring-width index) to reconstructed summer temperature at Fairbanks. Note the inverted radial growth scale of the lower two graphs. Correlation scores are between radial growth and reconstructed summer temperature in the previous year, which has been shown to maximize correlation (Barber et al. 2000). (A) Trees (n = 8) at a site near the tree line in the central Brooks Range (location 3, figure 12.2A) with positive sensitivity to summer temperature. (B) Trees (n = 4) from the same site in the Brooks Range with negative sensitivity to summer temperature. (C) Trees (n = 12) from Fort Richardson in Anchorage (location 1, figure 12.2A) with positive sensitivity to Fairbanks summer temperature. (D) Trees (n = 5) from Fort Richardson with negative sensitivity to Fairbanks summer temperature. or even persistence in the environment. In fact, white spruce is the only species for which a significant artificial regeneration effort is made on managed forest land in Interior Alaska, and relying on natural regeneration of this species is recognized as risky (Fox et al. 1984). The fact that the consequences of failing to reproduce are so serious for the survival prospects of a species suggests that episodic reproduction is actually a strategy to match reproduction to conditions that are especially favorable. It then follows that environmental stimuli are needed to cue the plant to the time when conditions are most suitable for reproduction. Climate variability, as the main feature of year-to-year environmental variability, is the obvious candidate to examine as a regulator of white spruce reproduction. Different investigators have reported a variety of observations on the magnitude, timing, and periodicity of white spruce cone and seed crops (Alden 1985; Dobbs 1976; Waldron 1965; Zasada 1972; Zasada 1986; Zasada 1995; Zasada et al. 1992; Zasada and Viereck 1970). The timing of white spruce cone production varies somewhat among trees, sites, and years (Waldron 1965; Zasada et al. 1992; Zasada and Viereck 1970), with both latitude and elevation affecting the periodicity. The timing of cone crops is quite consistent in the area of white spruce sampling reported here (figure 12.2). In British Columbia, the average frequency of good crops was 7 years for low-elevation sites and 12 years for high-elevation sites (Coates et al. 1994). In Interior Alaska, the average frequency for low-elevation sites is 10-12 years (Zasada 1972; Zasada and Viereck 1970). BNZ maintains a long-term record of white spruce reproduction based on seed fall as measured by seed traps on the forest floor (figure 12.3B). The seed-fall record presented here is a composite of the UP1A and UP3A sites. During the 39-year period, 1957-1995, seed-fall index values stand out for five different years (figure 12.3B). The years 1958, 1970, and 1987 had the major seed crops of the interval, and moderate seed crops were measured in 1972 and 1983. The 1958 (Za-sada and Viereck 1970) and 1970 (Zasada et al. 1978) seed crops have been recognized previously as major reproduction events for white spruce. The 1987 seed crop in the BNZ record is the largest of all. 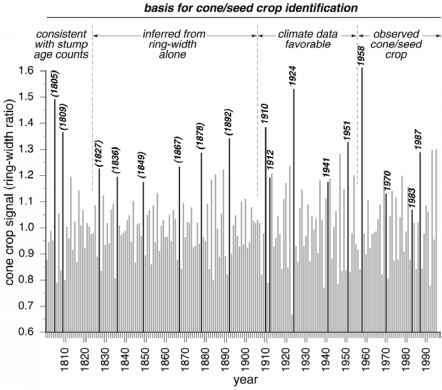 The majority of years functionally have no seed crop (figure 12.3B). Seed counts after 1996 were not completed for this analysis, but it was obvious that 1998 was a major seed-fall year, comparable to, although probably somewhat less than, 1958 and 1987. Figure 12.7 is a model of white spruce reproduction based on the literature and observations and data sets developed at BNZ. The model is based on key events or "gateways" that must occur to allow the reproduction process to proceed. Some of the gateways are categorical: If the event does not pass a threshold then the reproduction process does not proceed no matter how favorable the conditions for the gateways that preceded or will follow it. Some of the gateways operate in a scalar fashion: Better conditions will allow a bigger crop, whereas less favorable conditions will reduce the crop. The prerequisite (figure 12.7, step 1) of the process appears to be a sufficient level of growth reserves as indicated by recent favorable climate and radial growth. Several years in the period of seed-fall monitoring at BNZ have nearly all of the crop-promoting factors, but the trees start from such a chronically stressed condition that few or no cones develop, indicating that this is a categorical gateway. In the chronically warm and dry conditions of Regime 20.3, white spruce experienced threshold conditions to pass the second gateway consistently (figure 12.3A). The limiting factor became exceeding the threshold for growth reserves in the first gateway (figure 12.7). Under these circumstances, cool/moist conditions were limiting. Specifically, the 1983 crop of moderate size came at the first period of significantly improved climate favorability for radial growth following the longest drought stress period of the century to that point (figure 12.3A). Figure 12.7 Conceptual model of critical gateways (numbered circles) leading to the production of white spruce seed crops. For detailed explanation of gateways, see text. Events begin at the top of the left-hand circle (start year 1) and continue clockwise, then proceed to the top of the right-hand circle and proceed clockwise to seed dispersal at the end of year 2. Timing of gateways during the year is indicated by position on yearly circle with months indicated. Open arrows indicate critical thresholds being met by conditions identified on the outer perimeter of circle and seed-crop production proceeds through the gateway; filled arrows (pointed inward on circle) indicate either condition not met or marginal conditions likely to result in a low seed crop. Molder 1977). The literature has anecdotally suggested a relationship between warm, dry weather in the current year (inducing the crop) and following year (maturing the crop) and the production of cone crops (Alden 1985; Viereck 1973; Za-sada et al. 1978; Zasada et al. 1992). Drought stress appears to be the factor that causes the preferential differentiation of the bud primordia into reproductive sta-minate and ovulate buds rather than vegetative buds. During the generally cool temperatures and favorable moisture conditions of Regime 20.2, warm/dry stressful weather was confined to the intersection of peaking temperature cycles and precipitation cycles (figure 12.5) and appeared to be so infrequent as to be limiting. For example, the major cone crop of 1958 followed the warm and exceptionally dry summer of 1957 (figure 12.3A, B). The third gateway (figure 12.7, step 3) is a scalar process and involves the lack of severe pruning of reproductive shoots from wind and canopy snow loading in the fall and winter of the first year. The shoots are delicate and can be broken easily, especially when they have swollen and begun to elongate and then are subjected to extra loading from heavy rain or wet snow. The fourth gateway (figure 12.7, step 4) takes place in the late spring and early summer of the second year. High growing degree-day heat sums promote the maturation of the pollen and cone buds in time for the remainder of the steps to be completed before frost ends the growing sea son. Lack of sufficient heat will terminate the incipient crop. The final gateway (figure 12.7, step 5) involves both a categorical risk, the survival of pollen and cone buds in early stages (e.g., lack of killing frost), and a scalar process, heavy pollen flight (e.g., lack of persistent rains) to ensure high levels of cross pollination. A physiological response, produced by the previous year's white spruce seed crop, has been shown to affect the number of available sites for differentiation of reproductive buds, therefore successive crops are not possible, and excellent years are followed by crop failures or very poor years (Zasada et al. 1992). The moderately large and moderate-size cone crops of 1970 and 1972, respectively, are the most closely spaced in the observation period, indicating that a 2-year spacing of crops is possible under appropriate, but probably rare, circumstances. The "typical" cone/seed crops (those that did not follow within 2 years of one another) of 1958, 1970, 1983, and 1987 are marked with a specific radial growth signal. The year of cone/seed maturation is marked by a deep reduction in radial growth compared to the trend of the year prior and year following (figure 12.3B), even in trees entirely free from competition (Youngblood 1991). Thus the year of a major white spruce seed crop is marked by a steep V-shaped radial growth pattern. Single-year radial growth reduction during the year of production of a major cone crop is also known for douglas-fir, grand fir, and western white pine (Eis et al. 1965). A numerical index that reflects the degree of this signal is the mean of radial growth in the preceding and following years divided by radial growth in the contemporary year (figure 12.8). "Suspect" years that have a growth signal consistent with a major cone/seed crop match the BNZ seed-fall monitoring record, especially 1958 and 1987 (figure 12.8). The year 1969 began with weather in Interior Alaska that induced cone crop development, but an early season frost destroyed it (Zasada 1971), setting the stage for a somewhat reduced crop the following year. In northern British Columbia, 1970 was also a major cone crop year in white spruce (Eis and Inkster 1972). Prior to the period of seed-crop monitoring at BNZ, the Fairbanks climate record indicates strongly favorable cone crop-inducing weather (poor conditions for radial growth) in 1910, 1912, 1924, and 1940 (figure 12.3A,B, figure 12.8). For example, the earliest date (20 April) of ice breakup on the Tanana River at Nenana, 35 km downstream from BNZ, occurred in 1940 (Juday et al. 1998) because of a very early and warm spring that continued through May and early June. The record warm late spring and early summer of 1940 was ideal for the second gateway (figure 12.7, step 2) of the reproductive process. The second earliest breakup time occurred on 20 April 1998, the year of the maturation of another major cone crop in which warm early summer weather was ideal for the fourth gateway (figure 12.7, step 4). The induction of the 1998 cone crop came in 1997, a year of a very strong El Niño effect in Interior Alaska. Figure 12.8 V index of white spruce radial growth from nine stands across Interior Alaska. Sample includes all stands depicted in figure 12.2B,C, with the exception of the Reserve West stand that burned in 1983. Index is the mean of radial growth in the year preceding and following the test year divided by growth in the test year. Values are high when 1-year radial growth reduction is great. Dates highlighted include years of major seed crops monitored at BNZ (post-1957), years in which weather at Fairbanks was conducive to seed-crop initiation or production (1906-1956), years with no other information concerning seed crops (1827-1905), and years in which stump age counts suggest cohorts of seedlings (1800-1826). terior Alaska (Viereck 1979). The age structure of white spruce populations at the Rock Creek Long-Term Ecological Monitoring (LTEM) site in Denali National Park at tree-line in the central Alaska Range suggests that the major periods of recruitment to that population during the twentieth century took place as the result of seed crops whose timing matches the V signal identified here. The greatest recruitment to the Rock Creek LTEM population took place in the early 1940s, with additional peaks of recruitment at about 1910 and in the mid-1920s (Juday et al. 1999). Seedling white spruce with inferred dates of origin in the second decade of the twentieth century, suggesting a match with the 1910 and 1912 dates, were the second most abundant seedling age-class at Rock Creek. Little information is available to identify potential major white spruce cone/seed crops before the Fairbanks climate record began in 1906. The ring-width V index serves as a working hypothesis about which years may have been dates of major cone/seed crops, a sort of paleocrop proxy. It is interesting to observe that the intervals between major ring-width V signals from 1827 to 1892 are 9, 13, 18, 11, and 14 years (figure 12.8), intervals that are very consistent with those between major seed-fall years during the BNZ monitoring period of 1957 to the present (13, 17, 11 years). Of course, steep single-year growth reductions may occur across a population of trees for reasons other than climatic signals or allocation of photosynthates to cone maturation. In stem cross sections at several locations in Interior Alaska, the very low radial growth in 1878-1879 (figure 12.4) is also marked by indications of physical trauma and a change in the status of some trees from slow growing to fast growing and vice versa. These responses are consistent with a wind or snow breakage event and subsequent growth release or suppression, depending on the damage to the stem and its neighbors. Snow breakage is reported as happening in BNZ in 1967 (Van Cleve and Zasada 1970), and a major breakage event was observed again in 1990-1991. So, the V index for 1878 may not represent a reproductive event but a growth reduction from mechanical injury. Several older white spruce stands in and near BNZ that have been clearcut allow large numbers of low stump surfaces to be ring counted. Many of these stump counts cluster at dates just after 1805 and 1810. Allowing for a few years for establishment and early growth, we can reasonably infer that major seed crops were produced in 1805 and 1809. The ecology of white spruce growth and reproduction at BNZ is an excellent example of important ecological responses related to climate variability. The long time series available allows the identification of repeated outcomes of a system that includes as its interacting parameters climate (indicated by recorded data and reconstructed climate), tree growth (indicated by ring-width), seed crop timing and abundance, and stand age cohorts. The consistency of the response of the system across multiple cycles ("realizations" in time series analysis) is strong evidence in favor of an underlying causative mechanism rather than random patterns. Several of the years of key events described in this chapter happened during El Niño years. For example, the 1941, 1958, 1983, 1987, and 1998 seed crops were initiated and/or matured during strong El Niños. Since 1940, 15 out of the 17 years with the greatest area burned in Alaska occurred during moderate to strong El Niños (Hess et al. 2001). The contribution of the El Niño signal to the climate-growth-reproduction system described here should be further examined. Strong and moderate El Niños produce positive temperature anomalies in Interior Alaska but generally below normal precipitation, particularly in the winter (Hess et al. 2001; Ropelewski and Halpert 1986). El Niños represent a deepening and an expansion of the Aleutian Low, so that El Niño conditions are simply an amplification of the system we have already described. However, the El Niño effect is not completely consistent in Interior Alaska, which may relate to the path the Aleutian Low takes as it approaches Alaska. Changing climate sensitivity in the boreal forest is potentially a big issue for the future. Across the Northern Hemisphere, conifer trees at tree line have experienced a loss in climatic sensitivity at some sites (Briffa et al. 1998), causing reduced growth during warmer years as compared to the past. At least some tree-line populations of white spruce in Alaska have lost sensitivity altogether (Jacoby et al. 1999) and no longer respond to increased warmth. A recent review of the climate-related growth dynamics of tree-line forests in Alaska (Juday et al. 1999) has demonstrated that Alaska tree lines are responding in different ways to recent climate warming, depending on the location and environmental setting of the tree line. If climatic warming typical of that experienced in Regime 20.3 continues, changing sensitivity could become a widespread phenomenon with deep implications for resource management and the ecology of the Alaskan boreal forest. It also means that tree-line climate reconstructions should be viewed with caution. The original logical inference about the strategy of periodic reproduction was that it is designed to time infrequent reproductive events to particularly favorable periods and to minimize reproductive costs otherwise. So, what would be particularly favorable for white spruce reproduction in the pattern of timing described in this chapter? The key cue of environmental variability for white spruce is a critical period of warm and dry early summer weather in successive years (figure 12.7). The plant has an internal, hormonally driven system to detect and respond with maximum reproductive effort to the relatively infrequent intervals when strong stress is generated (e.g., by drought) (Owens and Molder 1979; Owens and Molder 1977). This same dry early spring weather and clear weather during the long days near the summer solstice represent fire weather (Johnson et al. 1992). It appears that the described reproductive timing of white spruce maximizes the odds that seeds will be released into a landscape in which fires have occurred recently. The thick organic mat of the forest floor of the boreal forest is a significant obstacle to white spruce seedling germination, survival, and growth (Zasada 1968). The reduction or removal of coarse or refractory organic material by fire or other methods can significantly improve white spruce seedling germination, growth, and survival (Zasada et al. 1992). The area of boreal forest burned annually in Interior Alaska reaches a distinct peak about every 10 years (Juday et al. 1998). Total area burned in Alaska is relatively well correlated with the May through August temperature in Fairbanks (Juday et al. 1998). The two years with the highest total area burned in Alaska since records began in 1955 are 1957 and 1969 (Juday et al. 1998)—years that are especially well matched to the large cone crops of 1958 and 1970. Surviving trees around the fire margin in both years, 1958 and 1970, released large seed crops onto well-prepared and receptive seedbeds. Clearly, a disproportionate share of the living young white spruce trees less than 50 years old in Interior Alaska are the result of reproduction in only four years (1958, 1970, 1987, 1998), based simply on probability. If an interval of 12 years is maintained between large white spruce seed crops over the life of a typical BNZ 200-year-old mature white spruce stand and the trees do not become reproductive for their first 30 to 40 years, then on average only about 14 major reproductive events occur during the life of a stand. Presumably, the entire Interior Alaskan boreal ecosystem is responding to the variability and alternating state of the climatic system (figure 12.3A) analyzed in this chapter. Our description of the periodic white spruce reproduction system and its apparent environmental controls is presented here for the first time, so corresponding responses for other plants and animals within the system have not yet been identified. However, it is not difficult to imagine potential subjects for investigation, ranging from regional populations of browsing animals dependent on early successional postfire vegetation to white spruce seed predators. The temporal association of tree reproduction with a particular sequence of variability in the climate system is itself a "cascade" through the system with respect to the flow of energy and information. If only the instrument-based record at Fairbanks (figure 12.3A) is examined, a substantial summer warming trend in the twentieth century is obvious. The 19772001 postshift mean summer temperature was 0.97°C warmer than the instrument record prior to that time (1906-1976). However, the longer view provided by the near 200-year reconstruction (figure 12.5A) suggests at least the possibility of a cyclic process in which the warming at the end of twentieth century is roughly matched by a warm period in the mid-1800s. As previously noted, peak mid-nineteenth century warmth in Interior Alaska was not reflected in Northern Hemisphere trends at the time, yet the warming is clearly indicated by Alaska tree-ring properties. By contrast, an annual temperature reconstruction based on 20 tree-ring width records for the past three centuries at tree-line sites in northern North America, Scandinavia, Siberia, and Mongolia is well correlated with a global energy-balance model that uses solar, volcanic, and anthropogenic trace gas and aerosol variations as three primary forcing functions (D'Ariggo et al. 1999). It appears that Interior Alaska summer temperatures were opposite the global trends during much of the nineteenth century and early twentieth century (Mann et al. 1998). However, during Regime 20.3 trends in Interior Alaska summer temperatures and northern hemisphere warm season mean temperatures are in agreement (Mann et al. 1998), and both sets of temperature values have reached some of the highest levels of the last two or more centuries. The consequences of these sustained high summer temperatures in Interior Alaska during Regime 20.3 include prolonged climatic stress that has resulted in decreased radial growth of upland white spruce, and large, frequent fires, decreasing carbon uptake and storage in this ecosystem. Alden, J. 1985. Biology and management of white spruce seed crops for reforestation in Subarctic Taiga Forests. Agricultural and Forestry Experimental Station, School of Agriculture and Land Resources Management, Bulletin 69, 51. Barber, V. A., Juday, G. P., and Finney, B. P. 2000. 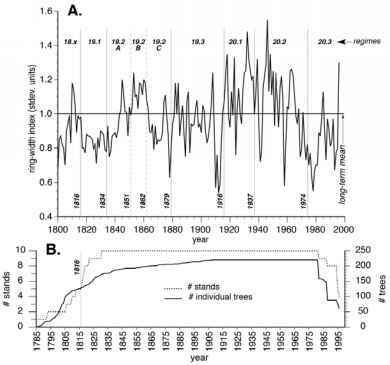 Reduced growth of Alaskan white spruce in the twentieth century from temperature-induced drought stress. Nature. 405:668-673. Barber, V. A., Juday, G. P., Finney, B. P., and Wilmking, M. In press. Reconstruction of sum mer temperatures in Interior Alaska from tree-ring proxies: Evidence for changing synoptic climate regimes. Climatic Change. Bonan, G. B., Pollard, D., and Thompson, S. L. 1992. Effects of boreal forest vegetation on global climate. Nature. 359:716-718. Briffa, K. R., Schweingruber, F. H., Jones, P. D., Osborn, T. J., Shiyatov, S. G., and Vagnov, E. A. 1998. Reduced sensitivity of recent tree-growth to temperature at high northern latitudes. Nature. 391:678-682. Coates, D. C., Haeussler, S., Lindeburgh, S., Pojar, R., and Stock, A. J. 1994. Ecology and Silviculture of Interior Spruce in British Columbia. Forest Resource Development Report. 182 pp. Cropper, J. P. 1982. Climate reconstructions (1801 to 1938) inferred from three-ring width chronologies of the North American Arctic. Arctic and Alpine Research. 14:223 - 241. D'Arrigo, R. D., and Jacoby Jr., G. C. 1992. 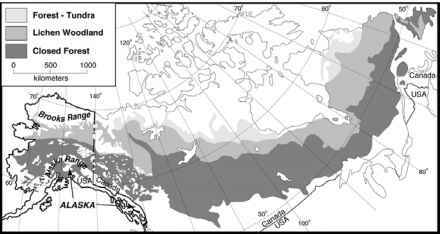 Dendroclimatic evidence from northern North America. Pp. 296-311 in R. S. Bradley and P. D. Jones, editors. Climate Since A.D. 1500. Routledge, London. D'Arrigo, R. D., Jacoby, G. C., and Free, R. M. 1992. Tree-ring width and maximum late-wood density at the North American tree line: Parameters of climate change. Canadian Journal of Forest Research. 22:1290-1296. D'Arrigo, R., Jacoby, G., Free, M., and Robock, A. 1999. Northern hemisphere temperature variability for the past three centuries: Tree-ring and model estimates. Climatic Change 42:663-675. D'Arrigo, R. D., Malmstrom, C. M., Jacoby, G. C., Los, S. O., and Bunker, D. E. 2000. Correlation between maximum latewood density of annual tree rings and NDVI based estimates of forest productivity. International Journal Of Remote Sensing. 21:2329 - 2336. D'Arrigo, R., Villalba, R., and Wiles, G. 2001. Tree-ring estimates of Pacific decadal climate variability. Climate Dynamics. 18 (3-4):219-224. Dobbs, R. C. 1976. White spruce seed dispersal in central British Columbia. Forestry Chronicle. 52:225-228. Dyrness, C. T., Viereck, L. A., and Van Cleve, K. 1986. Fire in taiga communities of Interior Alaska. Pp. 74-86 in F. S. Chapin III, P. W. Flanagan, L. A. Viereck, and K. Van Cleve, eds. Forest ecosystems in the Alaskan taiga: A synthesis of structure and function. Springer-Verlag, New York. Ebbesmeyer, C. C., Cayan, D. R., McLain, D. R., Nichols, F. H., Peterson, D. H., and Redmond, K. T. 1990. 1976 step in the Pacific climate: Forty environmental changes between 1968-1975 and 1977-1984. Proceedings of the Seventh Annual Pacific Climate (PACLIM) Workshop. California Department of Water Resources. Sacramento. Edwards, M. E., Mock, C. L., Finney, B. P., Barber, V. A., and Bartlein, P. J. 2001. Potential analogues for paleoclimatic variations in eastern interior Alaska during the past 14,000 yr: Atmospheric-circulation controls of regional temperature and moisture responses. Quaternary Sciences Reviews. 20:189-202.